The cover don't lie, this is a gorgeous book inside and out. Harlem Stomp is classified as childrens nonfiction, however its great for adults as well. Hill doesn't simply give us the Harlem Renasissance, she gives everything that lead up to it, beginning in 1905. Hill introduces Booker T. Washington and W.E.B Du Bois and his talented tenth. She tells of the beginnings of the NAACP in 1910. As with any book that deals with the history of race relations in this country, Harlem Stomp will make your heart swell sadness, anger, hope, and joy. It's filled with facts, photographs, paintings and the words and work of the Harlem Renaissance artists. The author highlights several artists, including Jean Toomer and Paul Robeson, Meta Warrick Fuller and Aaron Douglas. Harlem Stomp is a must for anyone who wants to learn more about the Harlem Renaissance. It was a 2004 National Book Award finalist. Akimbo and the Baboons by Alexander McCall Smith illus. by LeUyen Pham I really enjoy McCall Smith #1 Detective Agency series so I don't know why it took me so long to read books in the Akimbo series, also read Akimbo and the Crocodile Man. There are five books in the Akimbo series. Set in Africa, Akimbo's father is a head ranger, studying animals in their natural habitat. In each book people who study animals come by to visit Akimbo's father. Akimbo always finds himself involved in another animal adventure. This weeks C.O.R.A. Diversity Roll Call is being hosted by Ali @ Worducopia This time we are asked to find titles that would appeal to teens, that featuring male protagonist of color and are set outside of the U.S.
La Linea by Ann Jaramillo- 16 yr old Miguel is trying to cross the border with is younger sister. I searched for more titles but I am coming up empty. The next few titles came to my attention thanks to other bloggers. Taste of Salt: A Story of Modern Haiti by Frances Temple I have Mary Ann to thank for this one. Amy Bowllan has a wonderful series going on at her School Library Journal Blog - Writers Against Racism Its a must read. 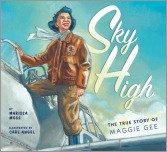 Sky High: The True Story of Maggie Gee by Marissa Moss illustrated by Carl Angel This is the story of Maggie Gee one of only two Chinese American women to serve in the Women Airforce Service Pilots (WASP) program during WWII. The book is broken up into two parts. First we get to know a young Maggie, who loved to go to the airport with her family on Sunday and watch the airplanes take off. Maggie's mother and grandmother would share stories about growing up in China. Maggie enjoyed these stories but she wanted a few stories of her own. Then the war came. Maggie Gee decided to do her part and make her dream come true at the same time. "I had read about a group of women pilots called the WASP, or Women Airforce Service Pilots. They flew planes on training missions and ferried bombers to military airbases. I knew right away that I wanted to join them. I wold be doing something important for the war, and I would be able to fly. If I could only earn my wings." Moss has done an excellent job with the text. This book is perfect for a young readers first or fifth picture book about WWII. There is a little something for everyone. Carl Angel's illustrations arebeautiful and a perfect fit. There is much action and color to keep young readers interested. One of my favorite pages is the transition from a young Maggie to the Maggie who will fly. "Many Sundays Passed, and now we were too old for lollipops. I didn't tell stories anymore but I still dreamed of flying." Its takes up two pages- Maggie is standing alone on the grass, her arms are out like a plane, eyes closed, her larger then life shadow spreading across the empty field. There is something very beautiful about this picture to me. Angel and Moss make you feel Maggie's dream. Twenty Miles by Cara Hedley Isabel (Iz) Norris has always played hockey. She's been told she has her father's hands. Kristjan was a hockey legend in their Canadian town, and he died before she was born. Everyone tells Iz stories about father, whether she wants to hear them or not. It almost as if Iz about Iz has always played hockey with the boys, until she is scouted by a college. Iz leaves her grandmother to go to college and play hockey for the Scarlets. Its only the second year of the teams existence. Iz is trying to figure everything out and learn how to fit in with her teammates. I loved the Scarlets. We get to know many of the core players like Hal, Boz, Pelly and Toad. They are funny, sometimes over the top and commited to each other. "And then we all fell. That second Hal hung her eyes on the scoreboard must have balanced us there, all of us strung together like a giant, moving mobile, before it crashed down, that second the clock couldn't shuck away, and didn't we all fall when she did, as teams do as families do. And there should have been a crash, we should have heard it, the hollow gunshots of our shin pads hitting the ice all at once, the thunderous crack of helmets colliding, of equipment cracking open and scattering across our ice. But, instead, a sound none of us heard with each other before, a hovering emptiness that was more quiet than quiet: as Hal fell, she inhsled all of our voices, all the swearing and insults and calls for the puck, all the laughter sucked in with her breathe as she fell, as we all fell. And we didn't know when she'd breathe it out again. When she'd let us play on"
I really enjoyed Twenty Miles. Though it took me a second to find the books rhythm. It moves quickly almost like improv. poetry. The beauty of the book was worth a few moments of confusion. "I attended the Coach House fall book launch dressed in a 2000 NHL all-star hockey jersey. And I was the only one in such an ensemble. I didn’t get a chance to talk to Cara Hedley then, but heard her read. The experience partially, though not entirely, reminded me of when I waited in line with my brother for three hours at Warden Woods mall in the early 1990s to get Patrick Roy’s autograph. We were huge Habs fans and the next in line when his handler said to the line, “No more that’s it,” and my mom started yelling at Mr. Roy. Thankfully however, the amazing Evan Munday put me in touch with Cara and I didn’t have to relive this rejection and celebrity trauma in my professional life." For Twenty Miles to remind the interviewer of Patrick Roy is any way is a very very good thing. Last week, I listed fall books I was looking forward to reading. 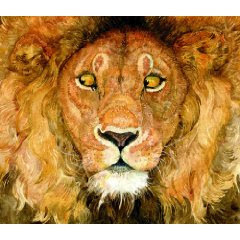 Two of the must read picture books are illustrated by Jerry Pinkney. The Lion & the Mouse (Sept) and Sweethearts of Rhythm by Marilyn Nelson (Oct) Both of these books look absolutely gorgeous. Pinkney has been illustrating children's books since 1964. There has been much talk recently about getting people to read and support children's author of color, like here and here. When I saw the two Jerry Pinkney titles, I couldn't help but think as hard is it is now for author's of color now, I can't even imagine what it was like 45 years ago. So I thought I would take a moment list a few artist as a thank you. These artist refused to be discouraged and allowed their talent to speak for them. Tom Feelings The first time I saw Soul Looks Back in Wonder, I was captivated by his beautiful illustrations. "I'm thrilled. I feel very grateful that the international community finds my work worthy of this award. I am pleased because, by selecting me, they have affirmed their interest in multicultural concerns and their support for cultural diversity. I hope to continue writing good books for some time to come. This is a culmination of twenty-five years of my career." Eloise Greenfield - Honey I Love, and Other Love Poems is amazing and beyond beautiful. Julius Lester Lester interviews James Baldwin in 1984 for NYT This little treasure I found by chance and it's worth reading. Our Children Can Soar, celebrates and recognizes various African Americans during the civil rights movements its a perfect fit for this post. All the artist I've mentioned have help make it easier for the next artist of color and they've contributed so much to the world of children's literature. To them I say thank you . To those artist I forgot or never knew please forgive my ignorance and accept my thanks. Open Court by Carol Clippinger 13yr old Halloway (Hall) is very good tennis player. She is ranked number four in the USTA, Junior Division, Girl's 14. With all of Hall's success comes more pressure to succeed. After Hall witnesses her doubles partner, Janie have a break down, she begins to doubt if she has what it takes. Her killer instinct is gone. We get to see all sides of Hall, on the practice court with her coach being pushed to the brink or hanging out with her friends. The author commited to the story on and off the court. On the court, Hall wants to be the best, worries about not meeting expections, and wonders where her coaches voice has gone and if it will ever return. "I quieted my breathing. And waited. Still, my guts weren't bubbling I closed my eyes, bowed my head slightly, listening, I felt a light rumble, mumble, in my belly. It was Coach's voice, finally but the volume was so low I couldn't decipher his commands. I bounced up and down, waking my feet. Quickly I tossed the ball and slammed my racquet into it. Out. Anyone can mishit. No big deal. Again. Toss. Slam the ball. Out. Come on, Hall I told myself. It's a serve to no one. Get it right! Again. Toss. Racquet back. Extend racquet. Hit it lightly. Nice and easy. Can't miss this one. But I did. Trent's voice is a part of my game. Makes me win. My guts churned, twisted. I felt light headed. Nerds: National Espionage, Rescue, and Defense Society by Michael Buckley. I loved two things about this book before page one. First, the multicultural cast. Second, the title acronym. National, Espionage, Rescue and Defense Society, couldn't be any better. Jackson Jones was Mr. popular at Nathan Hale Elementary until he got his braces. Before the braces everyone loved Jackson and wanted to be his friend. Jackson spent a lot of time tormenting the not so popular kids. ackson Jones was a bully. After the braces Jackson is friendless and lonely. Jackson eventually stumbles upon the NERDS secret chambers underneath Nathan Hale Elementary. NERDS is a secret organization created by the government in the 70's the agent's are always children. Jackson, accidentally acesses the physical enchancement protocol. The machine searches agents for weakness and enchances them. Those weaknesses then become the person strength. Jackson's braces are his weakness, he gets a serious up grade, and a new code name - BraceFace. Current Agents- Duncan Dewey, code name Gluestick, Matilda Choi code name Wheezer, Heathcliff Hodges, code name Choppers, Ruby Peet, code name Pufferfish and Julio Escala, code name Flinch. After his accidental upgrade, Jackson is asked to join the time by Alexander an agent sent by governments to oversee the NERDS operation. Agent Alexander shares a little of the history of spying with Jackson. All the agents hate Jackson because he was a bully. In front of the book, the author says he was a former nerd and it shows in his writing. Jackson isn't offered easy forgiveness . The other agents pretty much hate and don't trust him throughout the entire book. At one point Jackson, even quits the team. This was something very honest about there not being easy redemption for Jackson. The way he treated everyone pre-braces he didn't deserve it. I think I've managed the impossible, talking about NERDS for this long, and not mentioning how funny it is. NERDS is laugh out loud funny, thanks in large part to the Hyena, a hired assassin. I loved Hyena, she's my favorite character. She recently accepted a new position with Dr. Jigsaw, a man who wants to takeover the world. The NERDS are the only ones who can stop Dr. Jigsaw. I loved everything about this book. The gadgets are cool and slick. The writing is fast, fun, entertaining and well thoughtout. The fight and action scene are great. There are illustrations sprinkled through tout the book, adding just a little extra to an already great story. Young readers will love NERDS and its definitely reluctant reader friendly. Ages 8up Read a chapter NERDS will be on sale in September. If this sounds good check out The Big Splash by Jack Ferraiolo I loved this middle grade mystery. my review. After by Amy Efaw Devon's the star goalie on her high school soccer team and a straight A student but that was before. Now Devon might be charged as an adult for throwing her new born baby in the trash. Efaw spent much time with Devon creating a character who feels very close to real. The reader will follow Devon through the After, when she is taken to the hospital, where they must remove the umbilical cord that is still inside or when Devon is taken to the juvenile detention center as well as the hearing to determine if Devon will be charged as an adult. Devon's court appointed lawyer, Dom cares so she has a chance. The court room drama is excellent. "Devon consciously keeps her head down to avoid eye contact with the man as he steps to the front of the courtroom, swearing with his right hand raised that his testimony will be the truth, and seats himself on the witness stand- a square wooden enclosure with a chair inside, situated below and to the left of the judge. She wonders what he's here to say about her, who he is. She risks a peek up at him and sees that the man is directly in front of her and sitting surprisinlgy close to her. In fact other than Dom, he is sitting closer to her than any other person in the courtroom. Their eyes meet briefly. His narrow slightly, his lips turn down with distaste. Devon feels a cold prick inside her chest and quickly drops her face back down to her yellow pad, her cheeks burning"
Bitter Sweets by Roopa Farooki - Today over at Chasing Ray, Colleen is hosing a One Shot reading tour, focusing on works set in SouthEast Asia. Everyone was given enough notice to find a book. I waited until the last minute. I am more then half way done with Bitter Sweets and I absolutely love it. Rashid Karim and his parents think they found the perfect bride in Henna. On their wedding night Rashid who goes Ricky when at the University, discovers that his new wife is not 17 and well educated but 13 and illiterate. Henna agreed to help her baba deceive the Karim's in hopes of avoiding school and moving to Calcutta to become a movie star. This is a family saga that begins with a lie. Sometimes family sagas can be a little tedious and slow moving. This however moves at a nice pace and the language is beautiful, smart and funny. I highly recommend Bitter Sweets, you won't be disappointed. Published in 2007 this is Farooki debut novel. Spellbinder by Helen Stringer This was such a fun read, I loved it. 12 yr old Belladonna Johnson can see ghost, its a family trait from her mother's side. Belladonna continues to live with her parents after they die in a car accident. At school Belladonna does her best not to be seen talking to ghost, everyone already thinks she's strange. Stringer's captures much with her writing. Many readers will be able to sympathize with Belladonna's math crisis. Life continues like it did before the accident until all the ghost disappear. With the ghost gone everything in Belladonna's world is at risk. People aren't sleeping since there are no ghost to supply them with dreams. Belladonna must figure out what is happening, if she wants to see her parents again. She has two people to help, Steve a classmate and Elsie a teen ghost who died in 1912. Stringer takes the time to develop Steve and Elsie. I loved the interaction between these characters. Here are a list of some fall titles I am looking forward to. Peeny Butter Fudge by Toni Morrison and Slade Morrison, illus by Joe Cepeda - Sept.
Michelle by Deborah Hopkinson illus by A.G. Ford. Looking forward to this Michelle Obama biography because Ford is an illustrator to watch. Oct.
Olu's Dream by Shane Evans This looks and sounds beautiful. A must read. An Eye for Color by Natasha Wing illus. by Julia Breckenreid There is something about this cover that makes me want to see more. Sept.
Sky High The True Story of Maggie Gee by Marissa Moss illus. Carl Angel . In Sherri Smith's YA novel Flygirl. Ide Mae Jones passes for White so she can join the Women's Airforce Serive Pilots (WASP) during WWII. In Flygirl, Smith mentions that two Chinese women were members of WASP. Maggie Gee is one of these women. A must read Aug.
Never Smile at a Monkey by Steve Jenkins Oct.
Our Enduring Spirit President Obama's first words to America illus by Greg Ruth. The illus. for this book look amazing. NERDS by Michael Buckley - Read and loved the ARC. Kudos to the author for diverse cast of characters and storyline. Sept.
Luv Ya Bunches by Lauren Myracle - This ARC is in my pile, looking forward to reading. Look like a lot of fun and I get to use my favorite D word again. diversity. Viola in Reel Life by Adriana Trigiani Sept.
CatWalk Strike a Pose by Deborah Gregory, I've been waiting and waiting on this. The first one was great my review Sept.
Andrew North Blows Up the World by Adam Selzer. A 3rd grade spy. Fun must read for me. I loved Selzer last novel, I Put a Spell on You. my review. Bobby Vs Girls (Accidentally) by Lisa Yee - I've never read a Lisa Yee novel, this looks like a fun introduction. Sept.
City of Fire by Laurence Yep This looks great Sept. I Wanna Be Your Shoebox by Christina Garcia I loved this so much. my review. Paperback comes out in Sept.
Bad Apple by Laura Ruby Oct. Girl in the Arena by Lise Haines This sounds like it could be really good. Nice cover. Oct.
Front and Center by Catherine Murdock. I loved D.J. looking forward to final book Oct.
Liar Justine Larbalestier - This sounds really good. please ignore the old cover Oct. Rage by Julie Anne Peters Sept.
Once Was Lost by Sara Zarr Oct.
Bad News for Outlaws by Vaunda Micheaux Nelson, illus by R. Gregory Christie- The story of Bass Reeves, an African American lawman in the old West. This book looks great. Out now. On My Journey Now by Nikki Giovanni rerelease Sept.
What are you looking forward to? What am I missing? 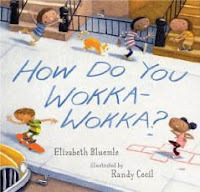 "Some days you wake up and you just gotta wokka Say hey to your neighbors, up and down blocka Wamma-lammy-wotcha-ho - do your funky wokka get your dance on"
The boy goes to the street and proceeds to ask the other kids how they wokka wokka. There is no one way to wokka. The first girl Wokka's like a flamingo. One kid goes old school with a very sweet break dance move. Another girl breaks out the snake. She calls it the fish flop but I know the snake when I see it. Soon all the kids are following the boy who had to wokka to a block party. Everyone in the neighborhood wokka's in their own special way. Everyone looks so happy. Bluemle and Cecil easliy give us a wonderfully diverse group of people. The text and illustrations are a perfect fit. Keena and her best friend, Eric are getting reading for second grade. Before school starts they get the bad news that they won't be in the same class. Keena likes her new teacher Ms. Campbell a lot. Keena's class is asked to write their birthdays on a paper birthday cake. Instead of writing out the month and the date, Keena uses numbers and accidentally inverts the day and the month. Keena's birthday is in Feb 9 but Ms. Campbell thinks it's tomorrow, Sept 2. Keena is ready to correct her mistake but then Ms. Campbell, mentions birthday cake. "I showed my note to Mr. Lemon. Then I started to talk. Sometimes when I have to go to Mr. Lemon's class, all my thoughts come out." Keena lives with her older brother Brian and mom in Washington D.C. Her dad lives in Maryland. The two visit their dad on the weekends. Keena loves to go to the coffee shop with her dad. "Dad and I like to have grown-up talks at the coffe shop. Sometimes we talk about how it can be a little bit hard for me to live in two different places. Sometimes we talk about how I will try to stay out of trouble so my teacher stops calling my dad's cell phone and using up his daytime minutes"
The Ring by Bobbie Pyron I found out about The Ring a few months back while browsing Authors Now , a site for debut children's and young adult authors. I sent the author an email, asking if she would send me a copy. I don't do that on a regular basis (only 2nd time) but I couldn't resist. A female boxer, that's too much temptation for me. If I had know Pyron was still working on The Ring, I would have waited. She was kind enough to send me a copy of her WIP. I liked it well enough but the final book oh my, I really really enjoyed. Some of the changes I noticed right off, others I could simply feel as I read but I couldn't point them out. That's probably for the best, part of the magic of reading a book is not knowing the work behind the words. 15yr old Mardie Wolfe is struggling to find her footing. The book opens with her being driven home by the police after being charged with drunk and disorderly conduct. While on punishment, Mardie is forced to go to the gym with her step mother, Amy. At the gym Mardie discovers boxing. On that first night she simply watched. Amy helps Mardie convince her dad its okay for girls to box. Mardie takes to the lessons but boxing isn't a sport that comes easy. Even though Mardie's discovered the ring, the chaos that is life doesn't stop. She still misses her mom who died in a car accident. Trying to do what she can to please her dad. Living in the shadow of her lacrosse star, older brother, Michael. A boyfriend who wants more then Mardie is willing to give. A bestfriend who won't return her phone calls. Those are only a few of the issues Mardie must deal with, and yes its a lot but somehow the author makes it work. The transtions are smooth, the storylines uncluttered. There is something about Mardie I really liked. I could feel her frustrations and self doubt. Mardie is far from perfect, she outs her brother to their parents out of jealousy. Now the Wolfe family must adjust to this new truth. Mardie spent more time training, getting the technique down then in the ring. There was something very honest and fitting about that. I really enjoyed the time Mardie spent with Kitty the trainer and the other girls. All the training is leading up to a tournament in Denver. Mardie lost her first fight, there are somethings even training can't help. very good. I loved the sparring Mardie did with the other girls in her gym. The author writing is good and she avoids stereotypical pitfalls. One of the other boxers, a latina, Shireen lives with her mother and younger siblings. When Shireen is asked about her dad, my first thought was uh-oh. Will he be in A) jail, B)dead or C)never in the picture. I was very happy to see it was D) none of the above. Shireen's dad in the reserves and was deployed for the second time. Pyron truly committed to Mardie. By the end Mardie finds her rhythm inside and outside of the ring. She can stand up to the other girls in the ring and to the classmates who mocked her, without her knees buckling. This looks like the first book in a series and I hoping that is the case. There is much growth protential for Mardie Wolfe and all of Kitty's girls. I look forward to reading more. The Ring is published by WestSide Books and is slated to be released Sept.
Rapacia: The Second Circle of Heck by Dale E. Basye - This is the sequel to Heck : Where the Bad Kids Go, which I loved my review . I love Bob Dob's cover art. It made me stop and take notice. Its a prefect fit for Basye's text. Milton wrongly sentenced to Heck makes his escape back to the living. Milton is adjusting well enough considering he was dead and in Heck. Now he is even more of an outcast. Milton is not worried about his status. He spends his time trying to contact his sister and finding a loop hole out of the contract he signed in Heck. Marlo a kleptomaniac is sent to Rapacia where the greedy kids go. The greedy kids are forced to live underneath one of the best malls ever, Mallvana. They much watch as all the good people shop their eternity away. Rapacia is run by Grabbit, a huge Frankenstein like rabbit who only speaks in rhyme. All the kids are drawn to the Grabbit and want to please it. Marlo is a star student, the Grabbit ask her to steal the hopeless diamonds. Marlo can't say no. I love these 12 yr old twins, there is growth with these characters. I thought it couldn't get any better than Heck, I was wrong. It's official I am loving this series hard. Basye has found a great balance of laughter and thought. "The Paranon mall was less a mall than a crazy old man's garage sale. Except that there was no garage. And, to the best of Milton's knowledge , nothing in the countless overflowing boxes and unruly stacks of yellowing paper was actually for sale. The crazy old man element, was spot on however." "But the human body, after death, weighs exactly twenty one grams less than it did when it was alive. Many philosophers theorize that this must be the approximate weight of the human soul, which as it is invisible wehn leaving the body must be a form of vaporous energy. Milton was swaying with full body nausea. He wiped his beaded- sweat mustache. I'm just not the same, I may have lost some energy coming back"
Silver Phoenix: Beyond the Kingdom of Xia by Cindy Pon - It's been a month since Ai Lang, first letting its time for her to get married. When Ai Lang is rejected by the groom she is embarrassed but not sorry. At this get together Ai Ling gets the first inkling of her powers. Her spirit can enter others, allowing her to see their thoughts and dreams. As the story continues her powers get stronger as well as Ai Lang's ability to control them. Unlike most girls her age, Ai Lang can read and write. She was taught by her father, a former high official at the Emperor's court. Ai Lang father's is called back to the Palace, it was suppose to take two months but after several months he still hasn't returned. Ai Lang and her mother are doing there best to make take everything while he is away. All is well until, Master Hung ( nearly 50, with 3 wives) a merchant tries to take advantage of the situation, claiming there is a debt to be paid. Master Hung will forget the debt if Ai Lang will agree to marry him. Ai Lang decides to run away to find her father, so her mother isn't at the mercy of Master Hung. Ai Lang, meets up with Chen Yong. Chen Yong is in search of his birth parents. In Xia he is treated has an outcast because he is not full Xian. Eventually the two run into Chen Yong's younger brother, Li Rong. Ai Lang must confront a man who has been stealing spirits in order to live. Chen Yong and Li Rong, agree to help. I loved these three to together, they had great chemistry. Though, Ai Lang, travelled with two guys it was never about which one she would love, and I appreciated that. Its not written in stone that a female and male lead must fall in love on a mission. This was a pleasure to read. Its filled with great action. Since the story is set in China, I couldn't easily anticipate what would happen next. Pon's writing is great, once I started I didn't want to stop. The cover doesn't do the book enough justice. I read Silver Phoenix because I kept reading great reviews about the book. If not for those reviews, I would have missed a great read. The cover simply doesn't entice me. There are two strong male progatonist in the novel, but neither are featured on the cover. Not putting at least one of the male leads on the cover limits the audience. The three travel most of the way by foot. There is one horse which Ai Lang rides. At one point the three must ride a dragon together. Cover option 2- The three riding a dragon Ai Lang is holding onto the dragon, Chen Yong holds onto Ai Lang, and Li Rong holds onto Chen Yong. When I read that scene I thought it worked very well visually and would make a great cover. Weapons showing of course. There's something about weapons that always makes me pause, unless I am on the street, then I run. White Bread Competition by Jo Ann Yolanda Hernandez. This book came to my attention thanks to a recent giveaway Susan had at Color Online , the winners. White Bread Competition was great. Its the 90's in San Antonio, Texas, Luz will be the first Latina to represent her state in the national spelling bee. White Bread Competition is made up of 10 interlinked stories that lead up to the big event. One of my favorite stories was Mixing the Ingredients. Luz's grandmother Aura, tells her something bad will happen if she enters the spelling bee. Rosaura confronts her mother for telling Luz such hurtful things. This story reads like a song, the movement is beautiful. Hernandez brings the reader closer to mother and daughter. The author does an excellent job of drawing all the characters, making the reader care. Being the first is never easy, someone says Luz cheated. There is so much to love about White Bread Competition. Rosaura is an artist and is showing at a local gallery. A White woman who's daughter lost to Luz puts down Rosaura's art and ask when her family immigrated to America? "My family became Americans when Texas was annexed just after my great great grandmother's birthday. We had already been living on this land for several decades before the white people, your people stole this country from us." "I'm fifth generation American. What generation are you?" I saw a movie the other day. One of those westerns. You know what I mean, where all the good cowboys are gringos and are going to save the poor Mexican farmers. When they ride into town, there's always some fat mexicana sitting alongside the road with a dozen little children running around her, making tortillas on a hot rock. Don't matter what town or how many times they ride in, she's sitting there cooking those damn tortillas with that brood of kids." Carmen steps into her high heels and says, "Let's hope the boss doesn't see that movie. He'll have us cooking on a hot rock to make the place more authentic."